Home Feature Articles Bitcoin and Bitcoin Cash: What’s the Tea? Bitcoin and Bitcoin Cash: What’s the Tea? As more and more people got into bitcoin, people started to have disagreements about the direction bitcoin should be going. Two groups wanted to go proceed with the development of bitcoin in two different ways. One group composed of mostly bitcoin miners, the other composed of the majority of bitcoin users and core developers. Both groups wanted to achieve the same end goal: more transaction data fit into a block. However, their methods differed greatly. The miner-dominant group wanted to expand the block size while the user and developer group wanted to implement Segregated Witness (SegWit) to compress transaction data. A hard fork seemed to be the only solution to the conflict. In August 2017, bitcoin cash (BCH) was created via hard fork. The user and developer group continued on the bitcoin (BTC) blockchain while the miner-dominant group took off with BCH. You’d think the conflict would start there but it turned out that it was only the beginning. Since its inception, BCH has been actively fighting for brand recognition and for some reason, the fight has turned into a “civil war” between the two crypto communities. There is so much animosity between the two sides and it’s not quite clear why. Bitcoin offers greater security and stability compared to Bitcoin Cash because there is more mining support behind it. Bitcoin is running 10x more full nodes than its forked counterpart meaning it has a more distributed network. The only drawbacks to it are transaction time and transaction fees. Transactions take much longer with BTC than with BCH and BTC collects much higher fees. The BTC community is outraged because the BCH community markets itself to be the “true bitcoin” and allegedly causes confusion, misleading buyers into buying BCH instead of BTC. Bitcoin Cash, on the other hand, is believed to be the “one true bitcoin” as it “follows Satoshi Nakamoto’s vision” for bitcoin more than the actual bitcoin crypto does. The BCH community prides itself for having lower fees and quick transaction times compared to BTC. Their main problem seems to be the lack of community acceptance. Fewer wallets and exchanges are supporting it compared to BTC. As reported earlier, the BTC community is filing a lawsuit against Bitcoin.com–a website run by BCH advocate Roger Ver, further intensifying the conflict. 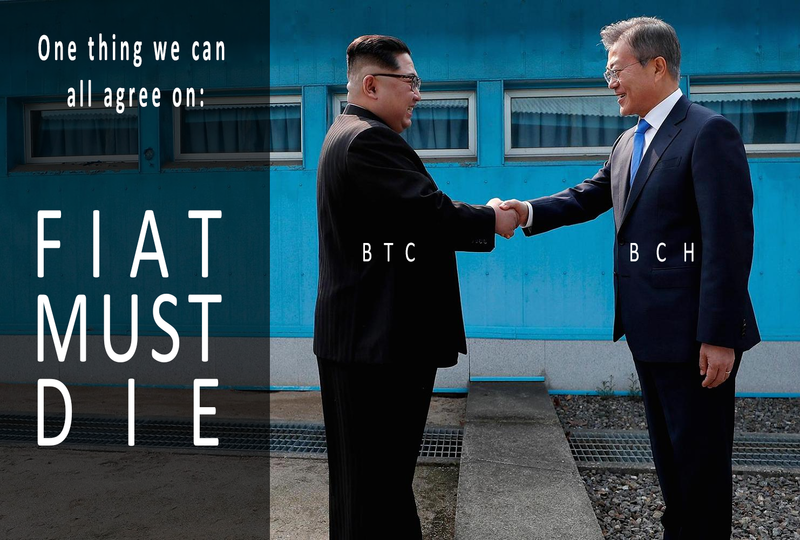 Why can’t BTC and BCH make like North and South Korea and just make peace and get along?